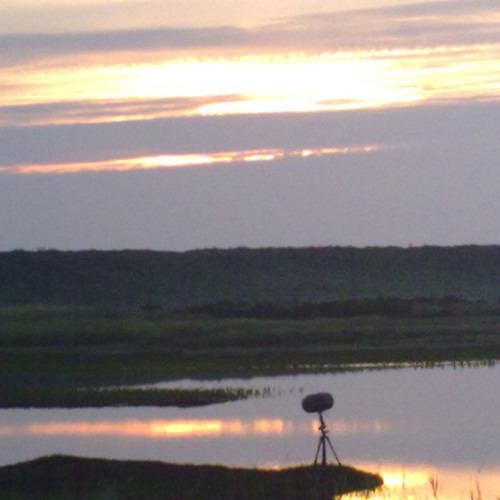 Recorded on Arnolds marsh at NWT Cley, North Norfolk on 5th July 2011 at dawn. Sea pounding in the background with lots of different birds calling. Gulls, Oyster Catchers, Meadow Pipit, Canada Geese, Skylark, Reed Warbler in the distance (I think! ), Pheasant, Pigeon, Duck, Cows and more.This was my third attempt at recording dawn here in a row. The first morning conditions were perfect, apart from someone decided to have a party in the village with a loud PA running all night (makes a change from aeroplanes I suppose.). Should have taken a dj set, instead of my recording kit! The second morning the wind got up. As they say "third time lucky". GEEK INFO: No eq used, no overdubbing, just crossfades from parts of a 6 hour recording condensed into 8 minutes. Recorded using Mkh 30/40 ms rig with 50 metres of cable running to Edirol R4 Pro recorded at 24bit 48Hz. @heathertamplin: Thank you so much for your kind words Heather. Download CLEY MARSHES, coastal birds at dawn. Users who like CLEY MARSHES, coastal birds at dawn. Users who reposted CLEY MARSHES, coastal birds at dawn. Playlists containing CLEY MARSHES, coastal birds at dawn. More tracks like CLEY MARSHES, coastal birds at dawn.